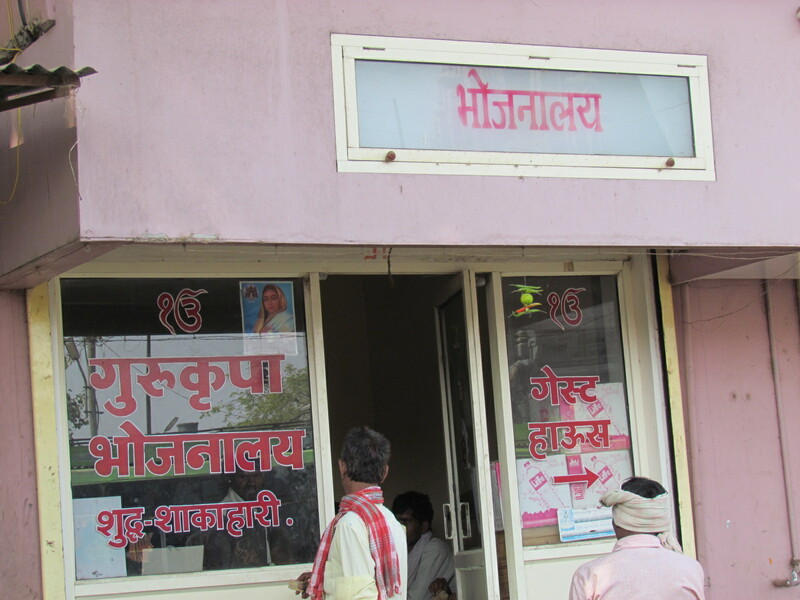 We happened to be entering Dhar during one of our long distant car rides & I asked the Driver ‘ What is a good place to eat here?’. He said there is a dhaba that is very good but that is not ‘fancy’. There is MP tourism & XYZ restaurant that are fancier. I said ‘but does the food taste good at the Dhaba’? & YES was the answer. With no second thought we drove off the main road towards theDhaba. It was a two storeyed building in which the ground floor was a 12 ft X 8 ft room that acted as a dining hall. There were rows of chairs & individual tables on both sides. As u enter the dining hall, you will be shown an empty chair. So you draw the table out into the aisle, get in, sit on the chair & pull the table in. Quite interesting space Management. We saw people from all walks of life eating together – from rickshaw pullers to daily wage erners to Company Sales Persons to locatites & to people like us. The owner was a soft spoken always smiling Sardarji who was himself serving the dals & the curries. He said during our little chat that he earlier had a nonvegetarian restaurant upstairs. Two years back he gave up Non vegetarian food & also stopped serving the same ‘do saal pehle mai nonveg khana aur khilana band kar diya’ – It is interesting to note that he had the courage to implement his personal decision on to his customers as well. The menu was fixed but unlimited & all for Rs. 50 +> a $1 unlimited lunch!!!! 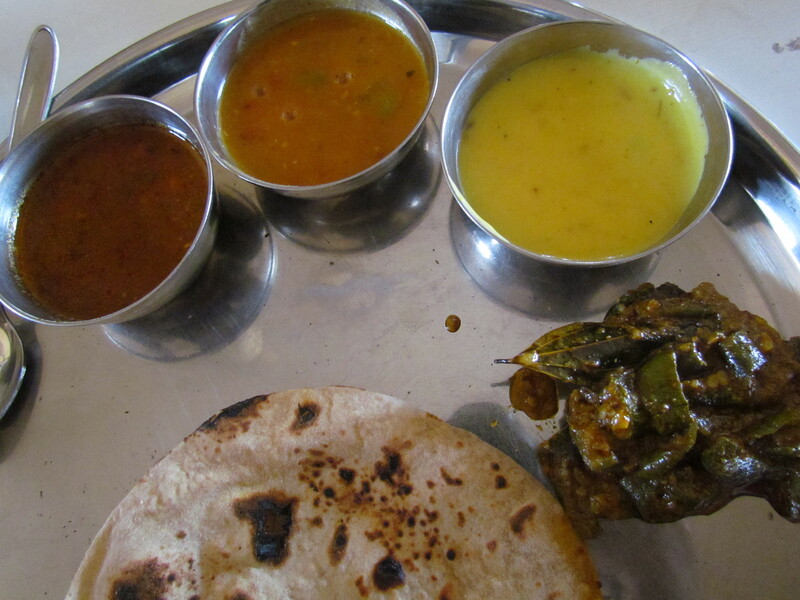 In a steel plate we were served four tiny bowls containing Chawli ki Subzi, Toor daal, kadhi & mixed vegetable curry. This was accompanied by freshly made phulkas with a touch of ghee in the center. A piece of roasted papad & little bowl of rice was also offered. The Chawli was essentially a smaller version of the lentil that we call Lobia. The dish had a consistency similar to rajma curry, was super spicy & mildly hot. 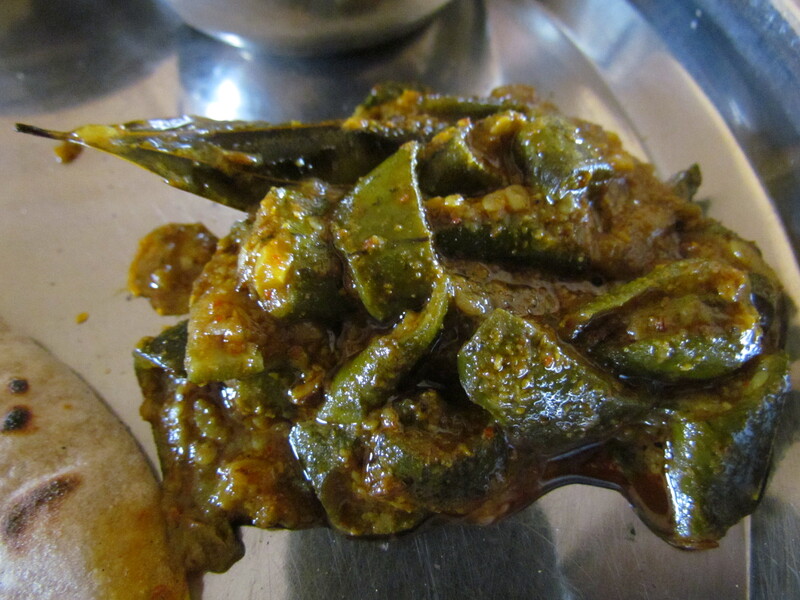 I spotted full fried cloves of garlic in it & the usage of khara masala was obvious – very rustic & thoroughly enjoyable. This was way better than the Daal Makhani that I had on the previous day ‘room service’ at Radisson Indore. Mixed vegetable curry had potatoes, capsicum, cauliflowers & carrots. Once again, this was made with khara masala & it tasted awesome. 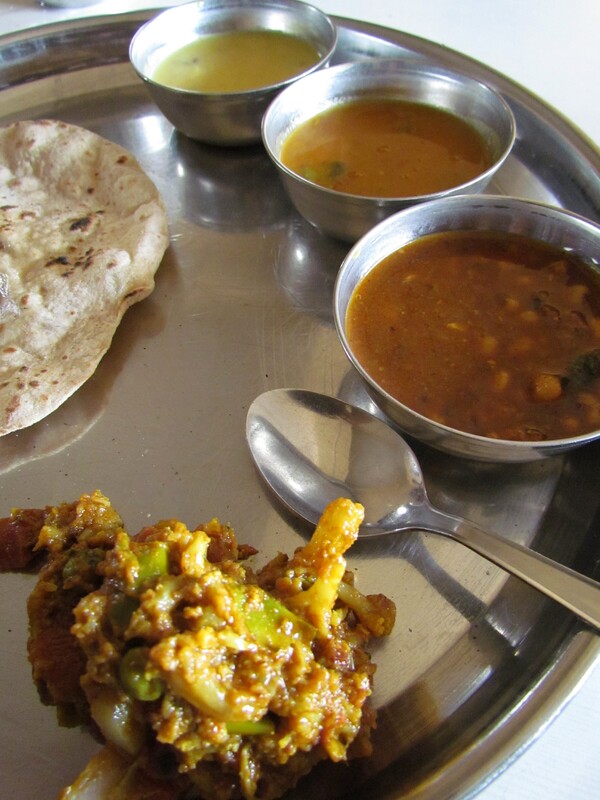 Unfortunately not one restaurant in Gurgaon serves such good simple rustic vegetable curry. The toor daal was the subtle one of the lot. Flavors of the daal were good & so was the taste. But as it happens in a group discussion, the soft spoken one gets overpowered by the more aggressive ones – here the more rustic & spicier chawli & mixed veg curry overpowered the tastebuds – leading to a ‘in hindsight appreciation – not on spot’. Loved the Kadhi as well – it was slightly sweet, like in Gujarati cuisine. Day 2: Went back again after a month & discovred that the menu for everyday is different. This time the star performer was a ‘Gilki ki Subzi’. Gilki is a veggie & it was cooked in a way that it retailend its texture & has an outstanding khara masala gravy. Loved it. The Kadhi was exactly the same as last time. The daal was subtle & nice but had suboptimal salt. The Chholey was spicy, had a good flavor & tasted good inspite of having a thin gravy. ……………..& all this wonder at $1 per person!!! !